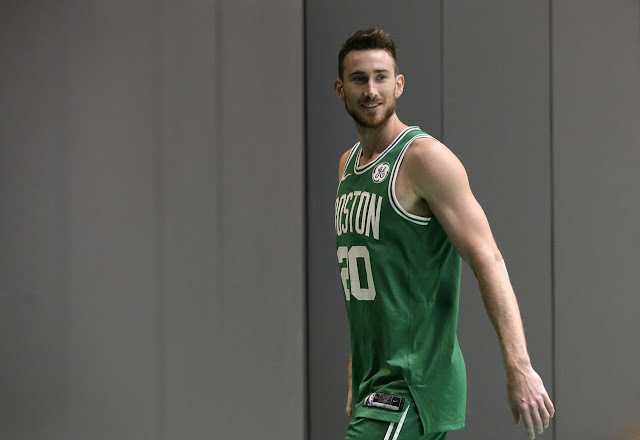 In his personal blog, Gordon Hayward does not hold back. It frankly is rare that an individual writes in a manner that allows you to enter their very mind. That is what Gordon does in his blog, and I commend him for it. All of the blockquotes are via Hayward himself. I’ve learned that I’ve got a lot of fight in me, a lot of perseverance to keep going. My passion for this game has been refueled. Throughout July, I was ramping up my work, doing sessions that had me slowly doing more and more. I worked on my jumper a lot. I started off only doing one or two dribbles and then a jump shot. Then I started being able to put dribble combinations together, a series of dribble moves and a jump shot. Then I was able to attack the bucket and do a layup. And then after that, I was able to dunk. But we just slowly ramped it up to the point that by the end of the summer, I was playing one-on-one and three-on-three. One-on-one, I played a lot with a guy named Daulton Hommes, who plays at Point Loma, a college in San Diego. Then, when I was playing three-on-three, I was playing with guys like Josh Childress, Travis Ware, Mike Roll. And then, my last week I was in California, I went to LA and worked out with Drew Hanlen and some of the other NBA guys he works with —Bradley Beal, Kelly Oubre, Meyers Leonard, Solomon Hill, Langston Galloway. That first time I played five-on-five, I was all over the place. I was so antsy out there. All you had to do was give me a shot fake, and I was flying past you. I was so jumpy and twitchy out there because it had been forever since I had played. Anyone who has ever played the game of basketball, knows 5-on-5 is much different that 2-on-2 or 3-on-3. You have 10 guys on the floor at once - the game becomes much more complex - and if you haven't played in a while, you feel like a fish out of water. But when you get hurt like that, there are going to be lingering hesitations. There is nothing that is going to fix the mental hurdle except for me going out there and actually jumping over the hurdle. But I know I am definitely going to be a little anxious going into it. And I feel like I’m just going to have to take the leap, and keep going. I have written previously about Gordon having "lingering hesitations" and being "a little anxious" upon his return to the court, and he is honest and direct when he writes about it himself. My conditioning as far as just running is great. As far as my cardio and physically running, we did a test the other day, and I was the last one standing on the team. Physically, from what I am told, the last thing to come is that explosion off my left foot. Being able to push off that left when I’m going right, when I’m going to the rim off of one foot, being able to just confidently jump off of it and finish at the rim, whether that’s a dunk, or a layup, or whatever—that is the last piece. I feel like I can do that off my right, but not necessarily off my left yet. Now Hayward writes about the major hurdle - exploding off that left foot. He wouldn't be human if he didn't constantly think of the pain and emotional trauma when he first saw that left ankle grotesquely out of place. More than anything, I’m excited to help us raise another banner. That is the reason why I came to Boston. I felt like this was where I could help win a championship. Gordon was made to be a Celtic - and to be back with his coach, Brad Stevens. He is 6'8" of talent, versatility and dedication. He can play four positions on the court, and do so very effectively. Boston came extremely close last season to moving on to the Finals while missing perhaps their two best players. Well, those two guys are back and the season is close to starting. Gonna be a good one. I’ve got to give Robyn the credit on this. She is really really great at this type of stuff, and she has organized a drive for school supplies at the Randolph Community Middle School this Saturday from 10:30 AM – 12:30 PM. There are some great prizes for the top donors, including autographed jerseys, tickets to a regular season home game, and for the top donor, tickets to a game where you’ll get to meet me and watch warm-ups courtside. And the first 250 donors who donate 20 or more items will receive a photo signed by me! We’re collecting everything from No. 2 pencils, pocket folders and spiral notebooks to USB drives, scientific calculators and headphones. 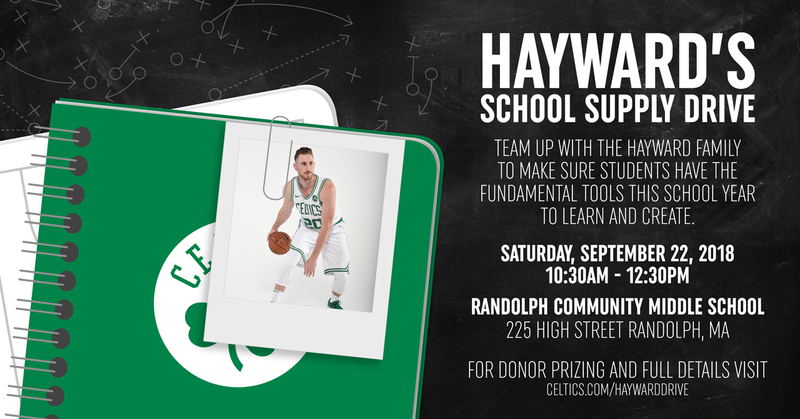 Go to Celtics.com/HaywardDrive for more details, including a full list of supplies being collected.